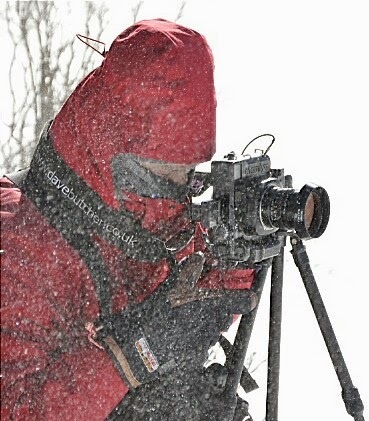 Using a Mamiya 7 Camera with Polarising Filter in a Snow Blizzard. The Mamiya 7 is a rangefinder camera, which means it is not possible to look through the lens, so normal polarising filters are difficult to use. Fortunately Mamiya make a special filter that gets around the problem. The bad news is that it costs £230 new in the UK. I bought a secondhand one for £90, including shipping, from Ffordes Photographic of Beauly and it looked like new and even had the piece of tissue on top of the glass that would be the first thing to be thrown away on first use so I don’t think it had been used at all! I actually bought it to take some photographs from the viewing gallery of a building where the only way to take photos was through glass. This proved to be only a partial success, there were just too many reflections. As it was a new toy I included it in my kit bag for our current photo trip to the USA. It fits to the lens so that it can be pulled up vertically. Once in this position you look through the filter as you rotate the front element. When you see the effect you are after you push it straight down in front of the lens. It is reasonably easy to use but means that the front of lens is open to the elements while you are adjusting the filter. There are 2 filter thread sizes for Mamiya 7 lenses but one filter fits both as it comes with an adaptor ring built in for both the 67mm and 58mm lenses. The adaptor ring takes some getting used to and is a nightmare to use with thick gloves in a blizzard! I ended up taking my gloves off when switching between lenses and suffered a bit of frost nip to my right index finger as a result. So how was it to use? In the city it was easy once I worked out how the adaptor ring fitted to each lens. 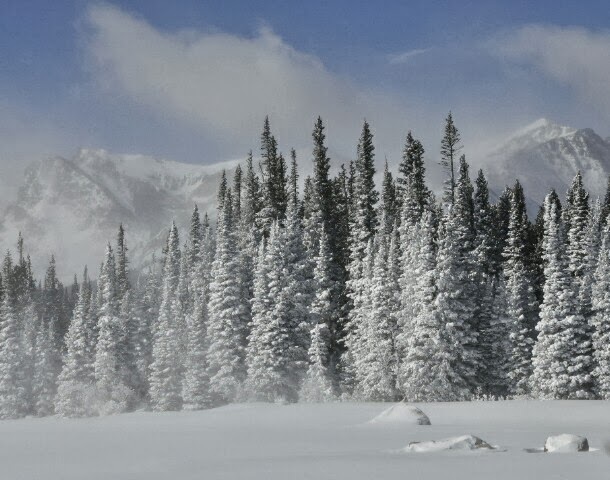 In the Colorado Rocky Mountains on a cold windy day after fresh snow it made taking pictures very difficult. 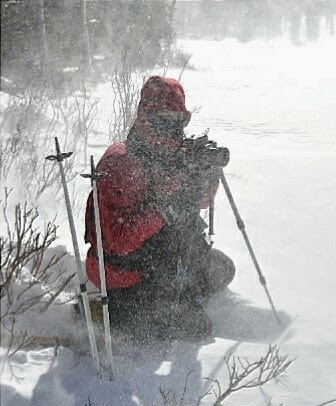 In fact I was using it between -15° and -20°C with winds gusting 25mph blowing powder snow around while standing on the frozen lake covered in about 15 inches of fresh snow while wearing snowshoes. First of all as you raise the filter vertically the front of the lens is exposed to the weather. In my case that meant I was getting snow on the front of the lens and the back and front of the filter. Not good and I did a lot of lens/filter cleaning during the 30 minute shoot! It was also difficult to rotate the front element of the filter to see the effect in the cold conditions. One thing I hadn’t expected was that it wasn’t possible to look through the raised filter with a second viewfinder attached to the hotshoe on the top plate of the camera. The 43mm filter needs this or you don’t know what you are taking photos of. This viewfinder usually stays fixed to my camera as I use the 43mm lens so much but the fixing was difficult to undo in the cold as my fingers were pretty numb by this stage (I left the polarised shots until after I had done the orange filtered shots). I used the 43mm and 65mm lenses, the foreground is more prominent with the 43mm but the mountains are more of a feature in the 65mm shots. The orange filter darkens blue sky well but also darkens green, sometimes too much, so I was hoping the polarising filter would darken just the blue sky and leave the greens alone. In the end I managed 3 rolls of Ilford FP4 120, that’s 30 exposures. One roll with the 65mm lens and orange filter, one roll with the 43mm lens and orange filter and one roll with both lenses and the polarising filter. Finally a bit of detail about the location. I was after a shot I had tried for on 7 previous occasions. It was from the surface of a frozen lake called Red Rock Lake in the Brainard Lake area of the Colorado Rockies (about 20 miles west of Boulder). At the end of the lake are dense conifers with Mount Audubon and Paiute Peak in the background. I also wanted good foreground interest, frosted trees and blue sky above the peaks, so not much to ask for! My wife Jan sheltered in the trees out of the worst of the storm during most of the time I was taking photographs, but did take some colour shots to give you an idea of the situation and conditions.